Shoring is the technique of using a temporary support, usually a form of prop, to make a structure stable and safe. To walls undergoing repair or reinforcement. To prevent walls bulging out. When an adjacent structure is to be pulled down. When openings in a wall are made or enlarged. There are three basic types of shoring system that can be used separately or in combination depending on the nature of the support required. Raking shores [see top image] involve inclined members, or rakers, typically placed at 3-4.5 m centres, and braced at regular intervals. They tend to be inclined at between 40-75º. Typical materials that are used include timber, structural steel, and framed tubular scaffolding. 250 x 75 mm wall plate secured with wall hooks, cleats and needles. 250 x 250 mm rider raker (the size is decided based on anticipated thrust from the wall). 225 x 50 mm binding to both sides. 250 x 250 mm top raking shore. 250 x 250 mm middle raking shore. 250 x 250 mm back shore. 250 x 100 mm sole plate. 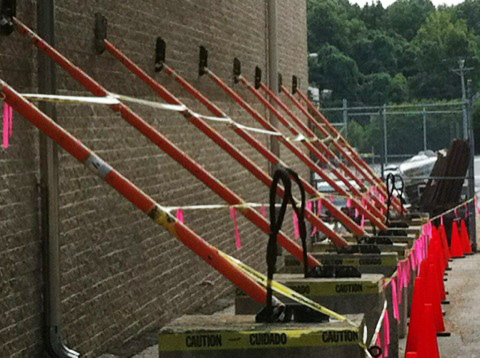 Dead shores are primarily used to carry vertical loadings from walls, roofs and floors. This is often required when an opening is being made in a wall, or a defective loadbearing wall is being rebuilt. An arrangement of beams and posts support the structural weight and transfer it to the firm ground foundation below. Example: When opening a wall, holes are cut so as to allow 300 x 300 mm beams, known as needles, to be inserted to carry the weight. These are usually placed at 1.2-1.8 m centres, and are supported by 300 x 300 mm vertical props known as shore legs at either end on both sides of the wall, with diagonal bracing as required. Needles are made of either timber or steel. The shore legs are taken down to a solid bed and secured on a 300 x 300 mm sleeper with folding wedges. The floor and ceiling finishes are removed locally around the shore legs. The shore legs stand away from both sides of the wall, usually allowing for a minimum of 1 m working space in between. To relieve the wall of the floor and roof loads, they are independently supported using 100 x 100 mm ceiling struts at 2 m centres. All doors, windows and other openings should be well strutted and secure before any dismantling work begins on the wall. Flying shores are used as an alternative to raking shores and provide a clear working space at ground level by exerting thrust on opposite walls, often the party walls of two buildings. If walls are at different heights, unsymmetrical flying shores can be arranged. Often this is in combination with raking shore principles, i.e. top and middle raking shores above a horizontal shore, perhaps with a bottom raking shore below, with binding to both sides as required. Example: Flying shores consist of horizontal shores (often 250 x 250 mm) placed between wall plates and supported by a system of needles and cleats. Inclined struts are supported at the top by needle and cleats, and by a 150 x 75 mm straining sill that is fastened to the horizontal shore. Single flying shores can typically be used for spans of up to 9 m. Double flying shores, in which two horizontal shores are connected using 150 x 150 mm studs, can be used for spans of up to 12 m.